pale flecks of quartz and feldspar megacrysts? By the poem’s conclusion we’ve been educated and teased out of stone clichés. to set each segment’s legs to run in waves. How well that distinctive word forcipules is set into the music of the line. Totterdell generally employs supple iambics or free verse, usually unrhymed though rich in unobtrusive harmonics. His stanzas often contrast longer lines with very short ones. lying scale to scale in a limbless embrace. to transcend that old instinctive urge to strike? Another poem that displays this poet’s gifts particularly well is ‘Mullein’. The first two stanzas show us ‘small fat grubs’, which could easily be destroyed with ‘a squirt of spray or a finger-squish’. of lemon curd, or how egg yolks ought to be. Many of the poems here ‘get right in’ and accept the complexity of nature on its own terms rather than our anthropomorphic ones. The human impact on wildlife is registered with moving understatement in the poem ‘Leatherback’, about those graceful and astounding turtles that increasingly fall prey to the plastic bags with which humans have cluttered the oceans. echoed in dark waveforms along its back. Almost as soon as I’d decided to try to write something in Jonathan’s memory, I saw a couple of personalised California license plates. They were on cars parked side by side in front of a house in a quiet street near where I was living on Sunset Boulevard in Brentwood: DRIVIN1 and JUSTHOM. They are not the best of the crop but I enjoyed the way DRIVIN1 combines letters and a number, like a good security code, and it uses the same number of units (seven) as regular license plates. It reminded me of Driving Miss Daisy and the 1 seemed a pleasant send up of ‘One’ or ‘Moi’. I began to make up some variations: CESTMO1; the more flamboyant FEISTY1; and the elegant if pretentious F1ANEUR. DRIVIN1 and JUSTHOM reignited the memory of the first personal plate I ever saw in California. It was back in 1983, soon after – I suppose – license plates became a site for personal display, propaganda and wit in the state. At $90 the cost of a personalised plate in California is not so high as to be restricted to the plutocratic classes as it is in, say, England, where we really do have have genuine ‘vanity plates’: this means that we get such tedious offerings from the moguls of Formula One motor racing as F1. I saw a more elaborate one – NO JOKE – on a red Corvette parked near Harrods but it failed to raise a smile. My epiphany in ’83 happened in a pleasant context. I was working with David Hockney, curating an exhibition of his photographs. One morning we drove down to the local art supply shop. We whizzed through and down the Hollywood Hills in his red Merc convertible. One of the operas for which he’d designed sets was playing on the sound system. He parked outside the store beside a car which had a plate with one word in raised blue letters: AMUSING. I think it’s still the best I’ve seen. I was impressed later that trip, in Sausalito, as a sleek black limo eased down the main street with dark windows and a plate announcing DRBLACK. I decided to assemble California licence plates in Jonathan’s memory. He liked to quote John Clare’s ‘I found the poems in the fields and only wrote them down’. I would look for poems on the freeway and, to make it more interesting, I thought I’d try my hand at inventing a few myself. The length of a personalised license plate can vary from two units to seven. The best personalised ones are composed of the full complement of available units, like AMUSING and DRBLACK. This gives the exercise a pleasant harmony with haiku (five syllables in the first and last line, seven in the middle line). Inventive license plates connect, of course, with – on the one hand – ‘cablese’, the abbreviations characteristic of the telegram era of times gone by, and, on the other, the new pleasures of phone-txting. It also shares some features with customised phone numbers such as the one by which you reach Mad Dog Express Shipping: 4 WE BARK. The great Californian photographer Ansel Adams had ‘license’, so to speak, to depart from the gold-standard of seven. His was ZONE V – Zone V being the mid-grey in his celebrated and influential Zone System. (Adams devised the system to allow previsualisation of the final print; this determined the requisite exposure of the negative). ZONE VII would have been more successful from my point of view but less so from his. GREAT4L, which I spotted one day, seemed a failure because a texter would write GR84L, which is elegant but falls short of the seven unit ideal. However, some good ones do fall short and it doesn’t seem to matter, as I soon discovered. A space is permissible, as in the recent sighting RL WOMAN. And that one reminds me of 62 IS BLU, in which the personal plate mingles with the personal ad. I noticed the egregious ETONIAN on a plate in Santa Monica Canyon but forgave it because of the car it adorned – a cream Buick Centurion convertible from the early ‘70s. It had a shark-mouth grille and a tan roof. It also sported a French national disc (F). A chrome I was missing so this dream vehicle appeared to belong to a French BU CK who happened to be an alumnus of Eton College. I think Jonathan would have enjoyed both the car and the flamboyance of its owner. While on the French theme, I liked LOUEST which not only tells us where we are but where, as it were, the driver is coming from. The spirit of place is even better and more briefly encapsulated in TRLA. There are guidelines as to what’s allowed on license plates. Racial, sexual and religious provocations are barred. I saw a plate urging SEEK JC (an unconvincing six units). A measured response would be ATHEIST. (Wikipedia informs us that in 2002 a Florida man was stripped of his plates, that read ATHEIST, but then allowed to keep them. A Virginian woman was not allowed HAISSEM, Messiah spelled backwards). However, wouldn’t SEEKS JC have been more attractive in the first place? I think GODISGT would be a dangerous choice, as would GODNTGT. However, GOD is apparently barred from plates except under such special circumstances as this: the greeting GOD SPD, which I recently saw on a vehicle tearing along the 405 freeway. The fast-paced abbreviation SPD restored my good humour. My mood was also enhanced by another recent sighting: OHPLEES. Friendly cheer could be attempted with ALACART, HAVAGD1, HIFOLKS, ROKNROL and TRUCKIN. The last of these must have been taken years ago but maybe all of these are out there somewhere. (It’s strange that losing the final g, as in TRUCKIN, seems either lazy or affected in English English but feels vigorous and natural in US English). I pondered other possible formulations. There could be ironic pride in OURLIMO, cheery satisfaction with ROADSTA, modesty about OURHAUL, wry realism with MYWRECK or COMMUTE and an outright lie with PORSCHE. However, my inventions were never as good as finds like MYQTBOX, on a rather modest auto (certainly not a seduction speedster) parked above the surfing beach at Santa Cruz. Politics could have been, and perhaps were, addressed during the long Democratic Primary contest by OBAMAOK or OBAMA08 – and here we bump up against another area of public abbreviation: bumper stickers. IMPEACHMENT IS PATRIOTIC is popular in California. I saw MORE TREES LESS BUSH in Oregon. STUFF HAPPENS is more popular, a friend remarked, on vehicles held together by ducktape and paint than on, say, a spanking new Lexus. The wit and wisdom of Donald Rumsfeld continue to ricochet around the highways: a sadly defunct emporium selling storage sheds, play equipment, gazebos and hot tubs in Brewer, Maine styled itself SHED HAPPENS. Getting back to plates, in 2007, according to Wikipedia, a South Dakota woman nearly lost plates that read MPEACHW (‘impeach George W. Bush’), but the decision was later reversed. Getting away from politics, this kind of thing is sweet – 26 AUG 86 – because it must be a birthday, wedding day or ‘the day we first met’. I also liked the lovey-dovey XXDEBXX and 2BMAMA, which reminded me that plates are given as birthday and Christmas presents. Petrol-heads like to celebrate their love objects with names like MY TOY (on a red Mustang with a female redhead at the wheel). A friend gave his Dad LABRLAW as a salute to his profession. I was told about the plate of a gay attorney in Ventura which niftily signals his places of work and play: LTHR BR. Lots celebrate dogs, like TOP DOGE (ie DOGGIE, much more appealing than TOP DOG) and 1WETDOG. I was touched by the plates of two gay booksellers in Ventura – BOOKS 2U and BOOKS 4U. That was matched by their neighbours GUDGRL1 and GUDGRL2. A one-car partnership proclaimed itself with 2MAVENS. I also saw the sad CHCKLES. The best recent one, up there with AMUSING is a complex plate that appears to blend aspiration with self-awareness: IDLISTC. A Mensa level offering came my way recently. Gordon Baldwin, an Angeleno friend of Jonathan’s, emailed: ‘The most clever license plate I’ve seen was on a very snazzy Mercedes convertible. It read RESIPSA. You know already, I suppose, the triumphant Latin legal phrase “res ipsa loquitur”, the thing speaks for itself, meaning no further proof is necessary.’ Other sightings that hit the spot are VAGABND, NCOGETO, BCMUSIC, POPCART and the laconic POSBL. I noted NOETA, surprisingly, not on the clogged freeways of LA but in rural Maine. A black Mercedes saloon, permanently parked in the gallery enclave at Bergamot Station, in Santa Monica, has ferns embedded in the hood. The license plate provides a title for the work: FARMLAB. As I left Bergamot Station, waiting at lights before turning onto Olympic Boulevard, I saw this in my wing mirror on a big white hummer: FEARING. Reversed by the mirror, it looked even more sinister. Perhaps it is a way of implying the embargoed word GOD – but I’m not sure that that would make it much more reassuring. There’s a whole genre, naturally, to do with gas prices and environmental concerns. I was startled to hear a new acquaintance refer to personalized plates as ‘environmental plates’. She did so on the excellent grounds that they were brought in to raise money for environmental protection initiatives, which continues today. That explains why Ansel Adams, a staunch environmental advocate but no show-off, had personalized plates. A friend saw the rueful ONEMPG on a giant SUV. An oppositional note was sounded by SUVHNTR. In Yosemite National Park I saw DRNATUR, OILWISE and GREENUP, all on hybrid vehicles. Heading back from Palm Springs to LA one Monday morning in early May, I kept my eyes open for plates. I was rewarded at once. I was driving through the massed wind farms of the Gorgonia Valley on Interstate 10. This valley is where the Marine Layer – the sea-mist that often hangs over LA – moves towards its opposite, the hot air above the desert around Palm Springs. Wind whooshes through the valley and thousands of turbines spin like crazy. That was happening as I drove and a high wind was pushing the car around. The plate I saw was ENTUNED. Perfect! The French call wind turbines ‘Aeolians’ – after the wind harps of classical Greece. I blessed the folks in the car, which was soon out of sight, and I went on feeling ENTUNED with them for miles down the I-10. And I also felt entuned with the strange, spectral, whirring blades and with my dear departed poet friend. I think I have, so to speak, Jonathan’s number. This is the one I feel sure he would like on his no-carbon celestial chariot: AEOLIAN. My wife Rosie and I worked in the same fields as Carol at the Victoria and Albert Museum. He was a very remarkable, pioneering, curator and had an enormous impact on the visual arts during his long and distinguished career at the V&A. If one phrase could sum up Carol it is Keats’s ‘a fine excess’. It is precisely one of the things that distinguishes a practitioner of [Cartier-Bresson’s] rank that from looking at a body of his work one is able, without any difficulty at all, to apprehend the broad qualities of his mind – in this case, his compassion, his hatred of pretence, his sense of irony, his care of innocence. It is a mind far nearer to Turgenev, shall we say, than to a Toulouse-Lautrec. That eloquent paragraph tells one a lot about the broad qualities of Carol’s mind too. At the end of the day’s work, when other curators would be on their way home, Carol would head for private views at leading avant-garde galleries. I learned from Carol that one needed to attend private views, to talk to artists and fellow-professionals, to be in the swim – to find out what was going on before it was in magazines, let alone books. This gave Carol the knowledge and confidence to acquire works of art and design with an audacious brilliance. His exhibitions must have influenced countless generations of budding artists and designers. Carol was not always appreciated by superiors like the director, Sir John Pope-Hennessy – who once remarked that running a large national museum was like governing a small colony – but, despite the obstructions put in his way, Carol reaped a great harvest. Carol was always tremendously kind to both of us. I have a very clear memory of him driving us down to Wales one year to stay with him in that amazing house, and then offering it to use again when we had two small children and a Polish au pair! I also remember dancing wildly in a favourite dress at a party which he gave and feeling so relaxed (very unusual for me at parties) because I felt I was with my tribe. It wasn’t just personal: he was such a huge asset to the museum and made a radical difference to its history. lt was a privilege, joy and a great good fortune to have known him. We think of Carol often and with pleasure. We still quote some of his favourite quotations, such as this one from the Dadaist Kurt Schwitters: ‘Everything that artist spits is art’. And this impressive put-down by Wyndham Lewis, used apropos his enemy Roger Fry and the Omega Workshops: ‘passéiste filth’. The last time we came to see him, Carol told a wonderful story of visiting the artist Stanley Spencer at Cookham on Thames. Everyone knows the striking biblical scenes Spencer painted, based on everyday life in his village of Cookham. Carol told us how the mists from the Thames shrouded the walking villagers each morning, until the sun dissolved the vapour and the wraiths became rounded, three dimensional beings in full colour. Thus, Carol noted, Spencer witnessed a daily Resurrection. What a marvellous image – once a poet, always a poet. In conclusion, Carol not only gave us – a generation of curators – an inspiring and creative role model. He gave us great friendship, which we shall always treasure. 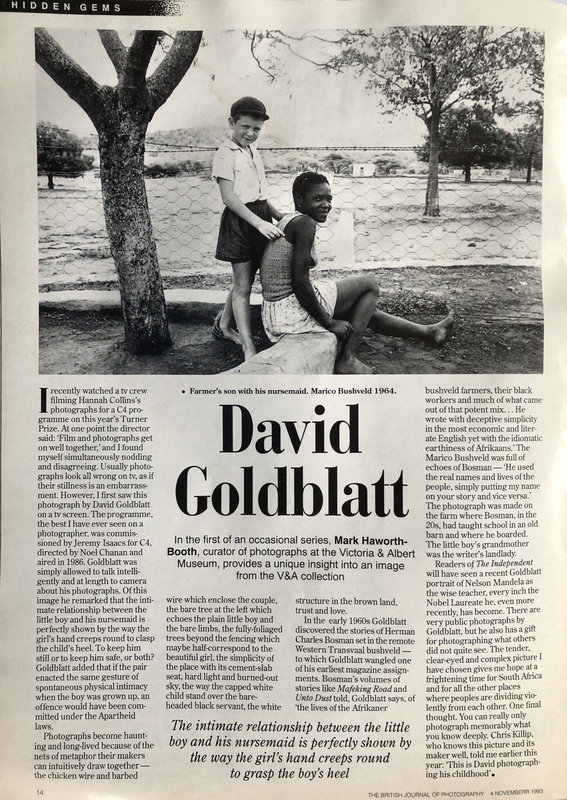 The great South African photographer died in July 2018. 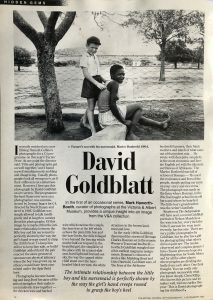 This is an article I am glad I wrote many years ago with his help (by fax from Johannesburg).